Apple's first major update to the Cinema Display line brings a much greener design and a raft of welcome feature updates, especially for MacBook owners. At the same time, a partial shift away from Apple's mainstay professional crowd makes one wonder where the company is going and whether it hasn't lost focus. Despite being named after a movie theater, the Cinema Display was introduced in 1999 as a screen first and foremost for desktop-owning professionals; if you didn't have a Power Mac using the then-new DVI standard, you were effectively locked out of ownership. It resembled a painter's easel and had nothing but its video input for a connection, but its matte, undistorted, widescreen image was a boon for AV editors who needed both workspace and a more representative picture. That all started to change in 2002, when the first DVI-equipped PowerBooks rolled out of Apple's factories. While the graphics hardware inside portable Macs was still somewhat anemic for a full dual-display setup to work well, it meant that PowerBook owners could buy a Cinema Display and use it as a desktop replacement. By late 2003, even the 12-inch PowerBook could make the pure digital connection to a Cinema Display —albeit through a bundled dongle. Combined with the front-facing ports of the Power Mac G5, these more advanced portables helped shape the first complete redesign of the Cinema Display introduced in June 2004. Aside from a thinner and more adjustable aluminum enclosure, which was ultimately a hint at the design of the iMac G5, its biggest additions were a pair each of FireWire 400 and USB ports that made it infinitely more useful for not just peripheral-laden desktop users but also PowerBook (and later MacBook) users who wanted a permanent hub for their peripherals. At the time, it was embraced as a strong example of Apple finally answering longstanding requests. After that, however, Apple fell silent. Beyond a quiet panel update in late 2005 and periodic price cuts, the displays had largely remained the same and increasingly felt like relics (which the 20- and 30-inch displays still do, as of this writing). In the meantime, third-party displays became increasingly less expensive even at the high end, where quality has improved as well; while there have been arguments made in favor of Apple's approach to color management, even Mac users have been known to joke in recent years that you bought a Cinema Display only to coordinate the fashion of your monitor with your computer. 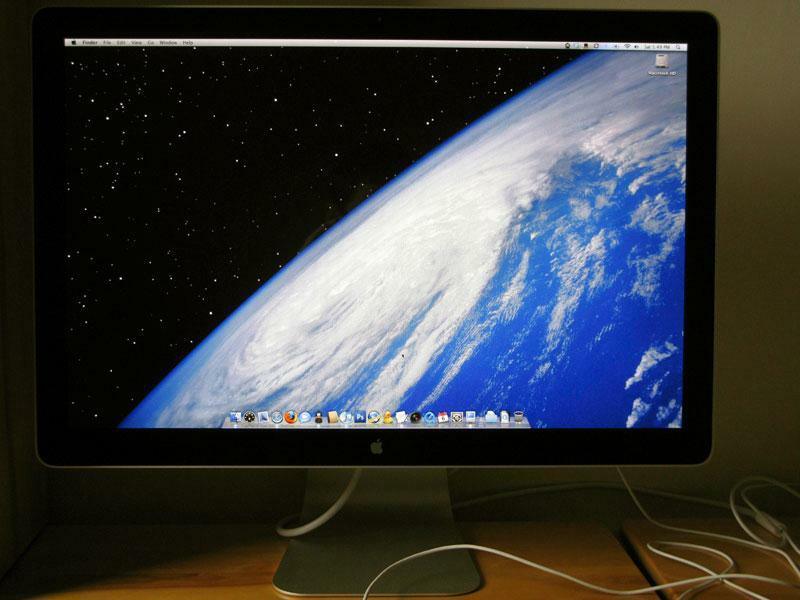 In some respects, the 24-inch iMac has been more suited to visual editing thanks to a significantly more modern LCD. November of this year finally brought some relief through the LED Cinema Display, though this is the first instance in which a significant update to an Apple display hasn't represented a complete remake of the entire form factor; as we'll soon see, though, most of the real changes are on the inside.